ANAHEIM, CA (February 27, 2014) – Bell Helicopter, a Textron Inc. company (NYSE: TXT), announced today its support for the Medevac Foundation’s HEMS 101 Project, which is dedicated to producing a set of guidelines for establishing Helicopter Emergency Medical Service (HEMS)/Air Ambulance Programs in nations that currently do not have services in place. 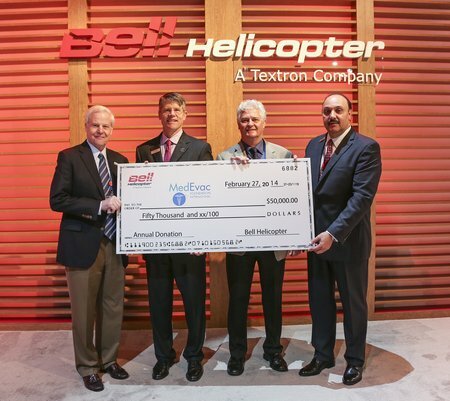 Bell Helicopter will make a $150,000 donation spread equally over the next three years in support of the project and presented the first funding check at a special ceremony at Heli-Expo 2014 earlier today. The partnership will showcase the unique ability of helicopters to remove some of the barriers to accessible and timely care. 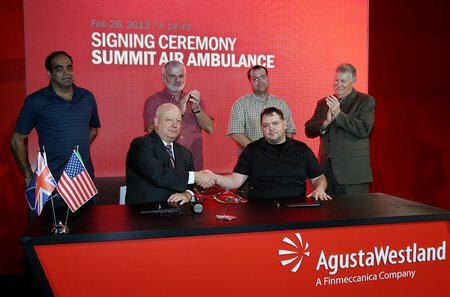 AgustaWestland, a Finmeccanica company, is pleased to announce that Summit Air Ambulance of Idaho has signed a contract for two AW119Kx helicopters to support EMS operations in the Northwest United States. The two AW119Kx will join an AW109 Power already in service, in addition to a fleet of fixed-wing aircraft. Walking With The Wounded have joined forces with the RFEA (The Regular Forces Employment Association) and Alabaré to fund an employment advisor to work exclusively with wounded veterans. Alabaré opened their first home for veterans in 2009 and have since established multiple homes across the South West of England, focusing on supporting wounded veterans through their transition into civilian life. The RFEA specialise in providing training opportunities and information to ex-servicemen and women and through Walking With The Wounded’s funding have hired Tony Lovegrove, ex-royal navy and involved in the judicial system, to lead the course with the aim of improving the skills and confidence of fifty-two wounded veterans over a twelve month period. 8 days and 5 very difficult and gruelling calls to the same area, on the same mountain, despite clear snow fencing, signage and media attention given to the risks of going out-of-bounds. 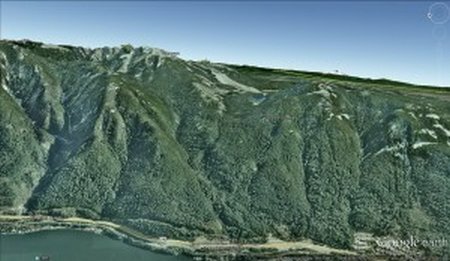 I am going to start out this post by saying that SAR crews are becoming frustrated. Going out-of-bounds puts yourself and others unnecessarily at risk. 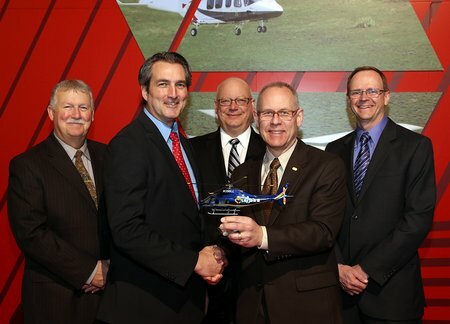 AgustaWestland, a Finmeccanica company, announced today that it has delivered the first of six EMS configured AW119Kx to Life Link III, an air medical transportation provider operating in Minnesota and Wisconsin. 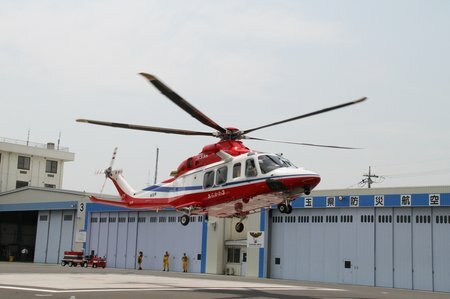 AgustaWestland, a Finmeccanica company, and Mitsui Bussan Aerospace are pleased to announce that Yamagata Prefecture Firefighting and Disaster Prevention Agency has chosen the AW139 intermediate twin helicopter to meet its operational requirement following a tender process. The AW139 helicopter is expected to enter service in the second quarter of 2015, replacing an ageing model. 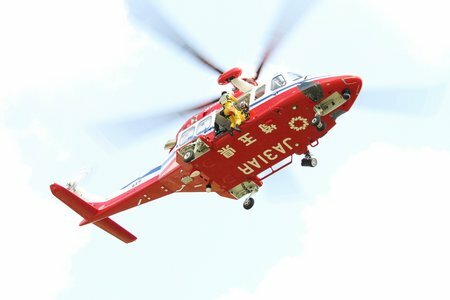 AgustaWestland, a Finmeccanica company, and Mitsui Bussan Aerospace are pleased to announce that Tottori Prefecture Fire Fighting and Disaster Prevention Agency has chosen the AW139 medium twin helicopter to meet its operational requirement following a tender process. This order further confirms the AW139 outstanding versatility for public utility missions in Japan and Northeast Asia. The AW139 helicopter is expected to enter operational service in the second quarter of 2015, replacing an ageing model. After their inaugural trip to Australia in 2013, a group of British and Irish Lions have set up The Triple Crown 2014. 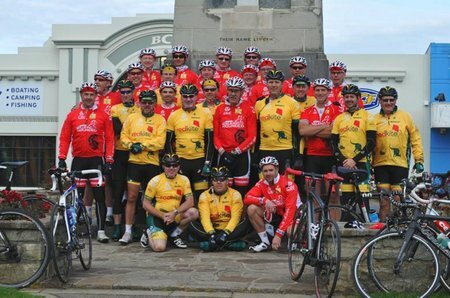 The challenge will see 150 riders take to their bikes, cycling almost 1000km route from Twickenham Stadium in London, to the Millennium Stadium in Cardiff, to the Aviva Stadium in Dublin and finishing at Murrayfield in Edinburgh, all to raise money for Walking With The Wounded. 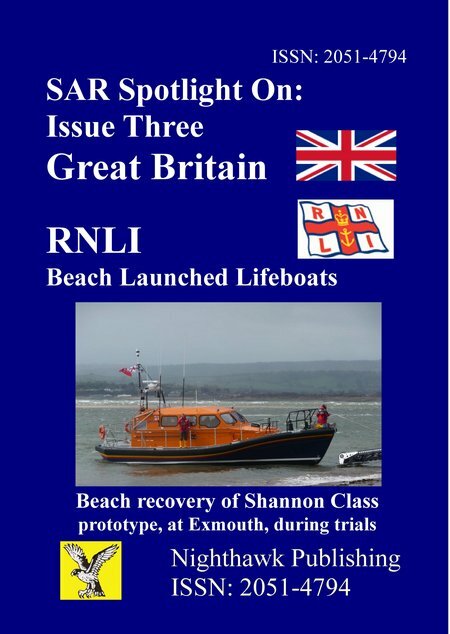 DOWNLOAD a free issue of “SAR Spotlight, covering RNLI beach launched All Weather Lifeboats. 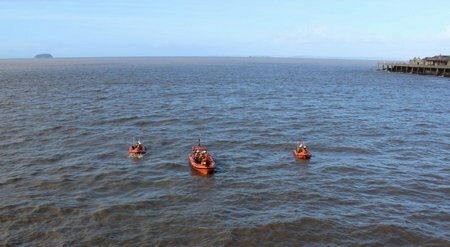 All three Weston lifeboats exercise despite the difficulties. Weston-super-Mar RNLI volunteers launch all three lifeboats to ensure they and the crews are ready of service. The RNLI lifeboats at Weston-super-Mare are not all in one station at present. As the volunteer crews cannot cross the Birnbeck Island Pier, except in case of a life being at risk, their main base is now the temporary lifeboat station which has been positioned at Knightstone Harbour. Here, a relief D Class Lifeboat, D 690, has been housed ready for immediate use. The main two Weston lifeboats are still housed on Birnbeck Island in the Boat shed there. It is hoped that in the not too distant future another temporary station can be found where these two lifeboats can be housed until a brand new station is built in the future.